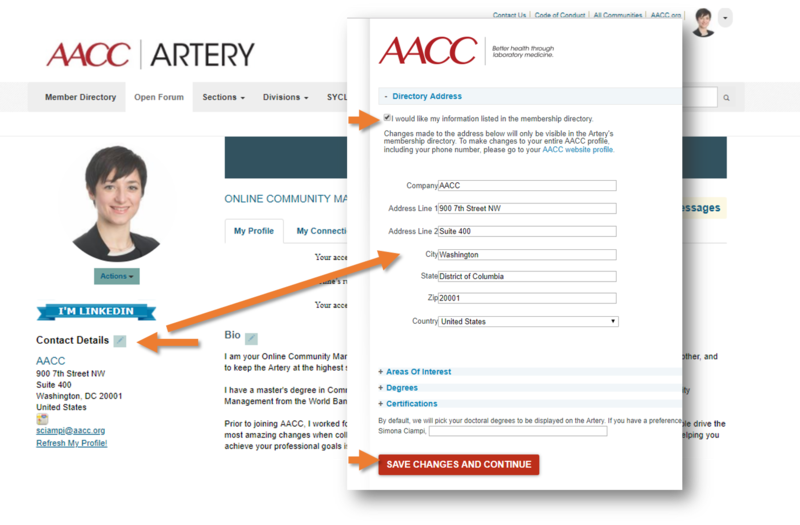 Whether you are a brand-new Artery user or a seasoned Arterian, these tips will help you get the most from your online community. 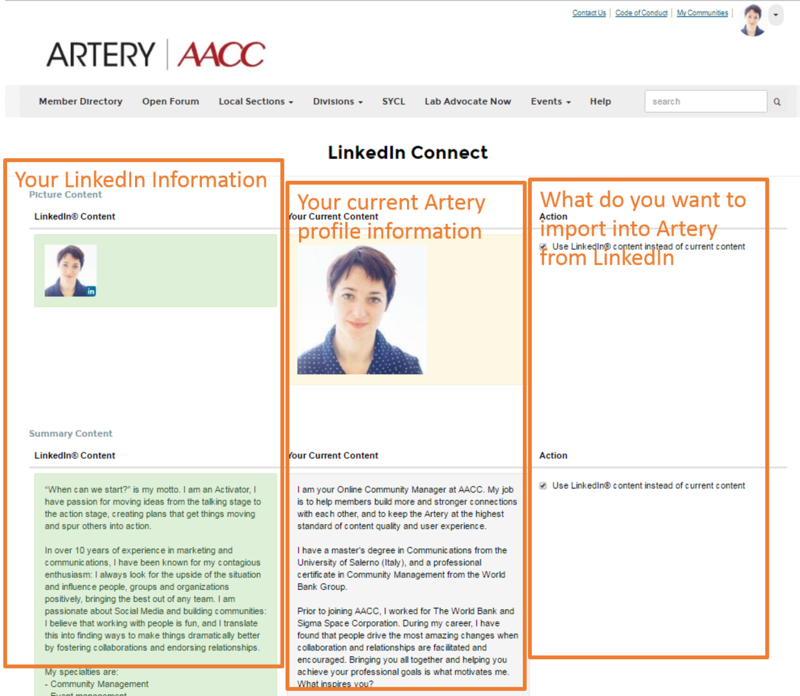 Artery enables users to import information from their LinkedIn profile into their Artery profile. This option will import some useful information and save you time. 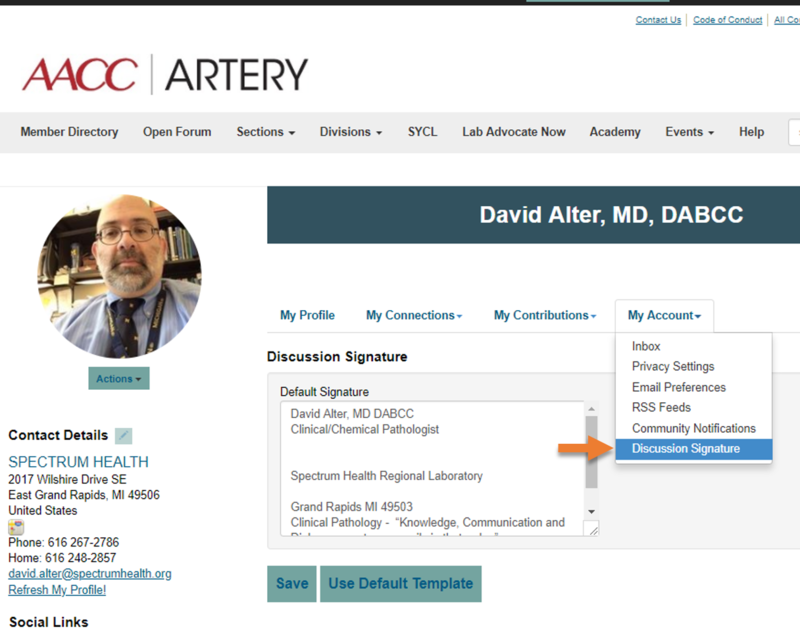 After you are logged into Artery, click on your profile photo in the upper right. A small profile box will appear. Click on the Profile button. You should now be on your profile page. Click the Import Your Info button just below your Bio section. You’ll return to your profile page and see that all of the information that you elected to import from LinkedIn has been added to your Artery profile. Having a picture in your profile will help you make meaningful connections within the community, and even to get a reply if you ask a question. Uploading a picture is easy. Click on your profile photo in the upper right. A small profile box will appear. Click on the Profile button. A file picker box will appear. You can drag a picture file into the file picker or click Choose File to browse for a photo to upload. You’ll be returned to your profile page where you’ll see your new picture has been added to your profile. Artery gives you the ability to decide the level of privacy you prefer to set for your own profile. Adjusting your profile’s privacy setting will allow you to choose which information you want to expose publicly, what you want to share with your all fellow members or only with your personal contacts. Click on the profile photo in the upper right. A small profile box will appear. Click on the Profile button. You should now be on your profile page. Click the My Account tab, then click on Privacy Settings. You’ll see a screen that allows you to hide or expose your profile information as you see fit. There are four privacy settings, described below, from most private to least private. Only Me: No one can see this information on your profile except for you. 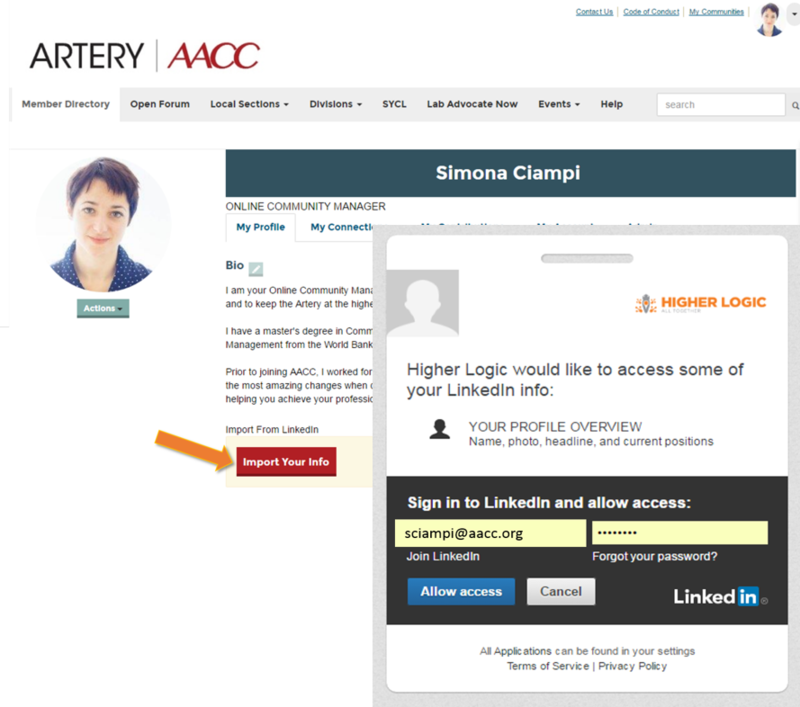 Members Only: You may want to expose more information to all AACC members, such as your job title, profile picture, employer. 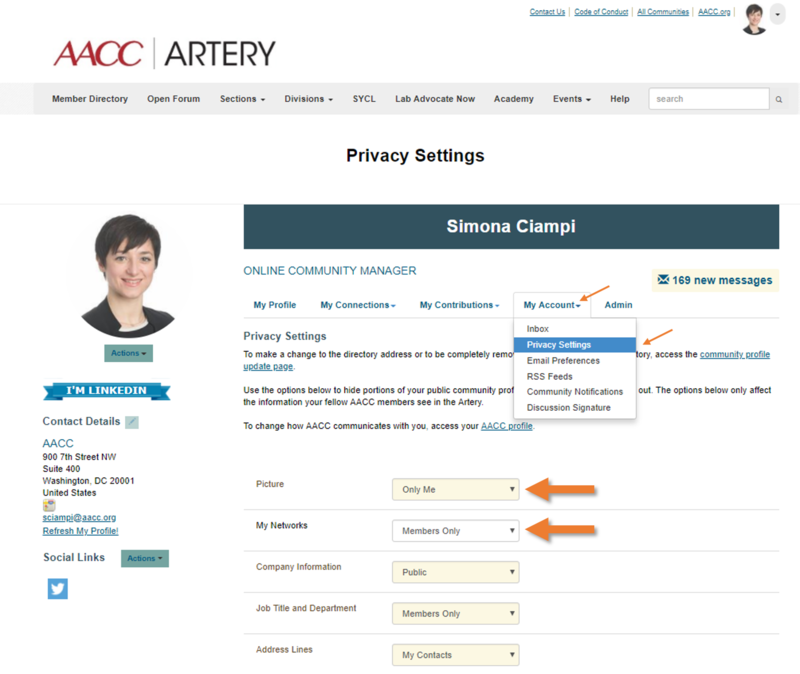 Public: Although this is a separate privacy level in Artery, effectively, public means Members only, because only AACC members can access Artery. My Contacts: You can choose to share with only members that you’ve added as contacts some information you may deem to be more private, such as your email address or phone number,. Once you’ve set your privacy settings, click the Save Changes button at the bottom of the page. Your profile is your central identity in AACC Artery and AACC in general. Your colleagues will go there to learn about you, understand your expertise, and read content you’ve written. Check if you are searchable in the Member Directory; if not, follow the steps below to make sure your peers can find you. You should now be on your profile page. Click the pencil icon on the side of your Contact Details. You’ll see a screen that allows you to change your address. On top of the address there is a line of text that says “I would like my information listed in the membership directory.” Click on the check box to enable your profile to appear in the member directory. Then click Save Changes and Continue. 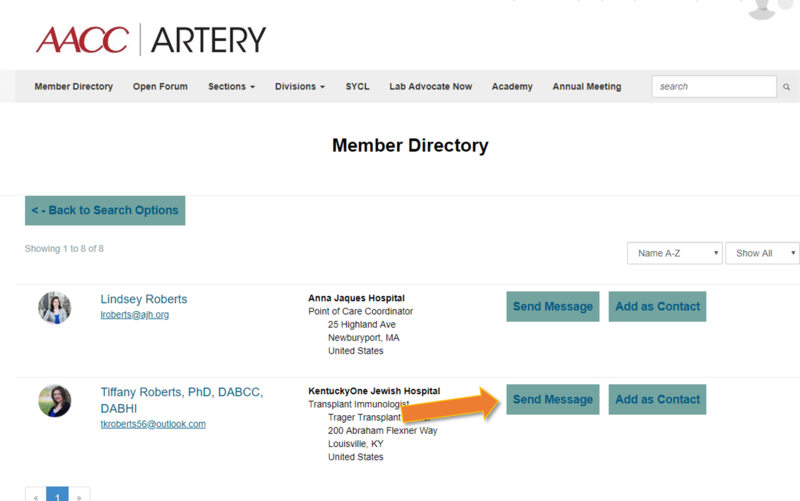 Artery offers a sophisticated Member Directory that offers new ways to build your network. 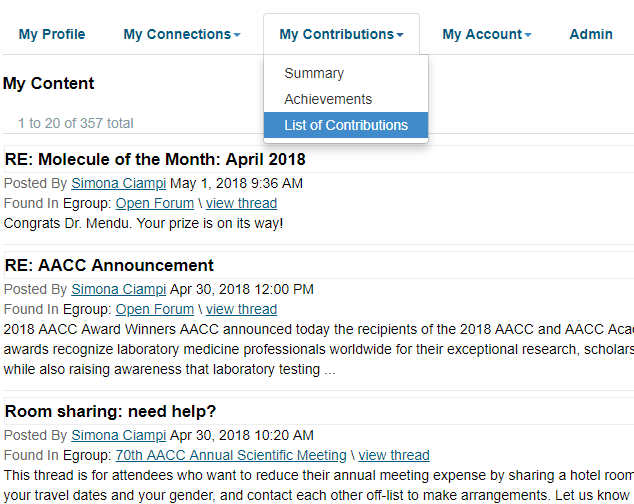 Learn how to use the advanced search to discover how much you have in common with other members. Click on Member Directory, and search by name, last name, company, or email address. 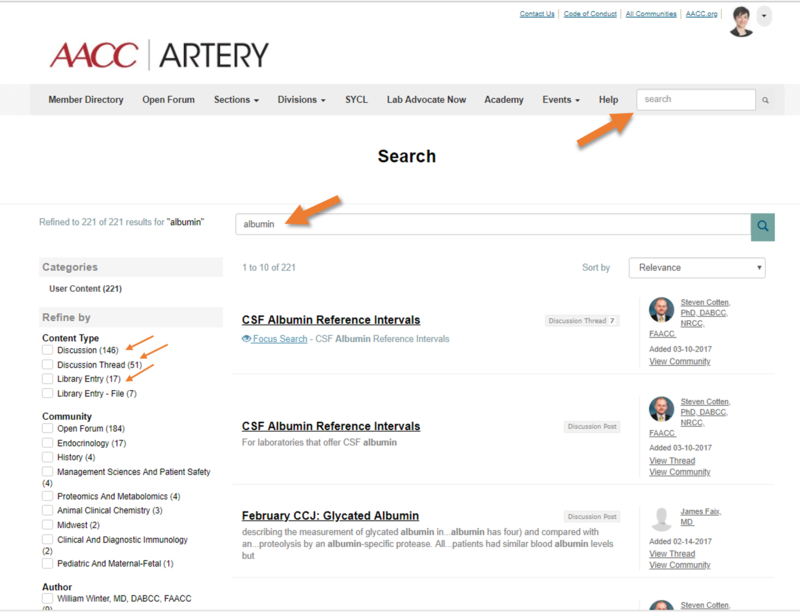 You can click on the Advanced Search to search by interest areas, location, member type and several other criteria. Once you have found someone, you can privately message him/her or add him/her as a contact to share information and build your network. What keeps you up at night? What are you currently working on or struggling with? Most likely, someone in the Artery is going through the same and can help. Share your thoughts by starting a new conversation with a question. Navigate to a community of which you are a member. Click the Add button next to Latest Discussion Posts. 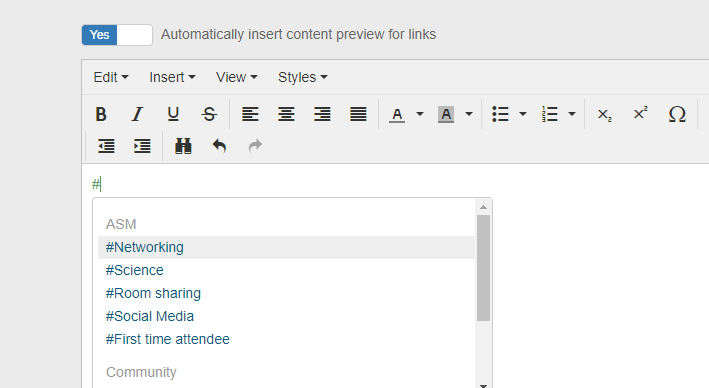 Give your post a subject, then compose your post in the WYSIWYG box. You will have the option of attaching a file to your post. When you are satisfied with your post, click the Send button. If you want to be on top of the trends, it is important for you to receive email communications to alert you of new discussions or new replies that might be relevant for you. To learn the difference between Real-Time, Daily, and Consolidated digests, see tip #8. To change your preferences, follow the steps below. You should now be on your profile page. Click the My Account tab, then click on Community Notifications. On this screen, for each community that you belong to, you can choose whether to receive notifications in real time, once per day in a digest, or never, or in a consolidated digest. Real Time Notifications are ideal for people who want to know immediately about new discussions in their communities, or who don’t want to log into Artery in order to participate in their communities. Real time notifications enable you to receive the full content of each new message as soon as it is posted. You do not need to visit Artery in order to post a reply to a discussion. Just click the reply button in your email client, compose your post, and click send in your email client. Depending on the number of communities you belong to, and the number of posts added to those communities per day, you may find the volume of email to be difficult to manage. You will receive notifications that files have been attached to posts, but you won't receive notifications of new events added to your community or files added directly to the community’s resource library. Daily Digests are ideal for people who belong to fewer than five communities and who want the option to reply to discussions without having to log into Artery. If you belong to five communities, and all of them receive posts in a single day, you’ll receive five digests for that day. Depending on the number of communities you belong to and how active members are in posting content to those communities, you may find the number of digests to be too many. You will receive notifications that files have been attached to posts, but you won't receive notifications of new events added to your community’s calendar or files added directly to the resource library. 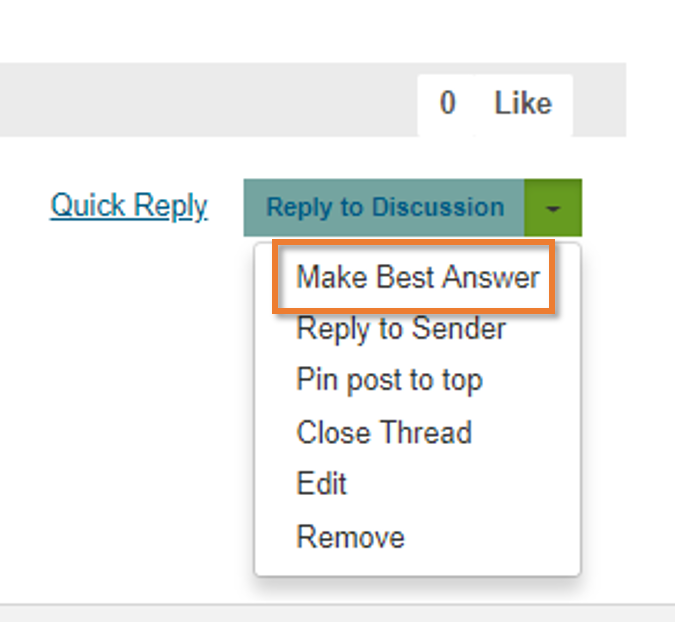 Within a daily digest, you can reply to a given post by clicking a Reply To Group button within the digest. When you do so, a new email composition window will open in your email client. Compose your reply and click send right inside your email client. 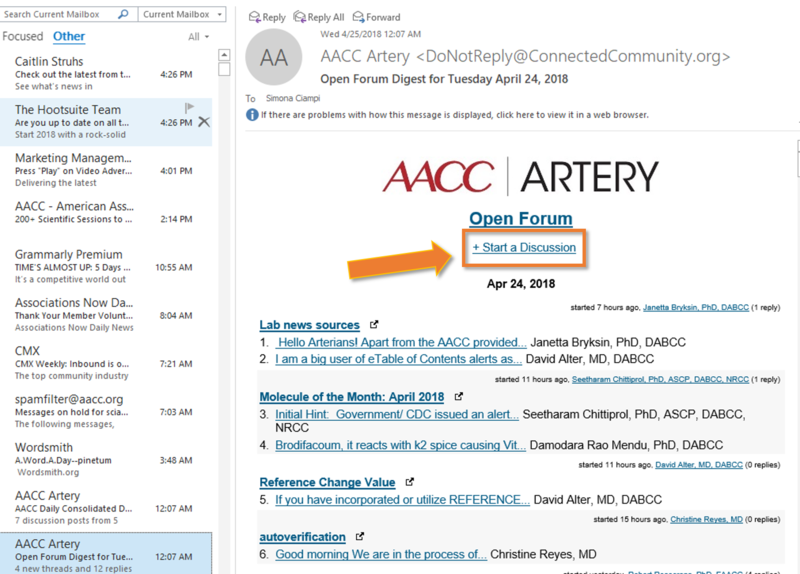 Consolidated Digests are ideal for people who want to scan activity across more than five communities and keep the number of emails to a minimum, and who are comfortable visiting Artery in order to read full posts or reply to posts. A consolidated digest compiles in a single daily email a truncated (approximately 250 character) summary of each and every post within all communities that you belong to. If you belong to nine communities, and all of them receive posts in a single day, you’ll receive just one digest for that day. The consolidated digest includes links to calendar events and links to documents that have been added to your communities. You cannot reply to discussions directly from your email client; you must visit Artery in order to reply to posts. To read any post longer than approximately 250 characters, you must visit Artery. 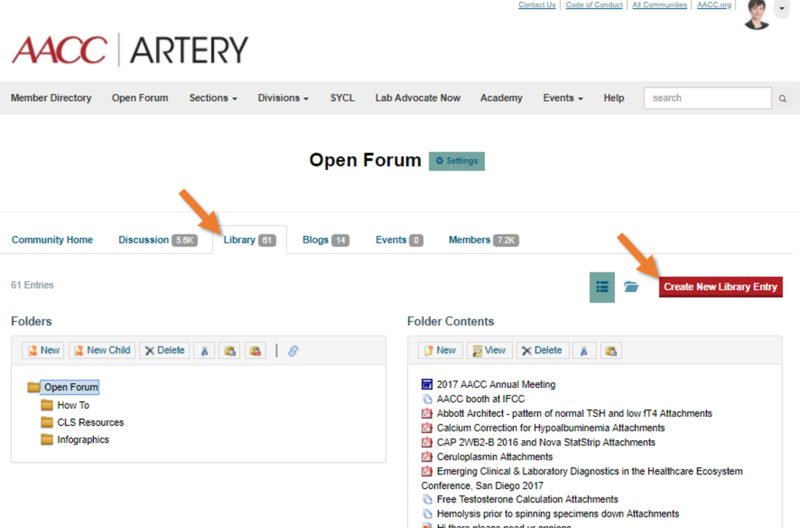 Click on the Open Forum or any other community button in the navigation bar. Select Library within that community home page top menu and click on Create New Library Entry. Follow the prompts to add the resource. Choose your document or resource and upload. Looking for a certain discussion topic? Use the search feature. Type the name or a keyword of the discussion you’re looking for in the search box on the upper right-hand side of your screen. 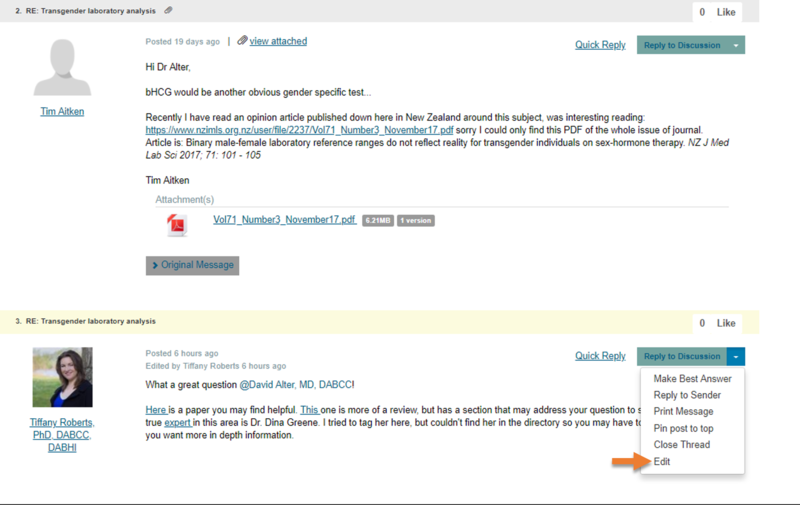 Your results will show relevant discussions, library entries and more. Editing your post is a quick way to clarify or correct something. Go to your recent post and click on the arrow next to Reply to Discussion. Customize how you would like your name and information to appear when you submit your post. Click on My Account and choose the option Discussion Signature. By default, your e-mail is shown as it appears in your member account. If you would like to change your default signature, you can type in the information you want to include in the signature. Add contacts so you can send messages to stay in touch, ask questions or build a referral network. When you view another member’s profile, you’ll be able to see any contacts you have in common. 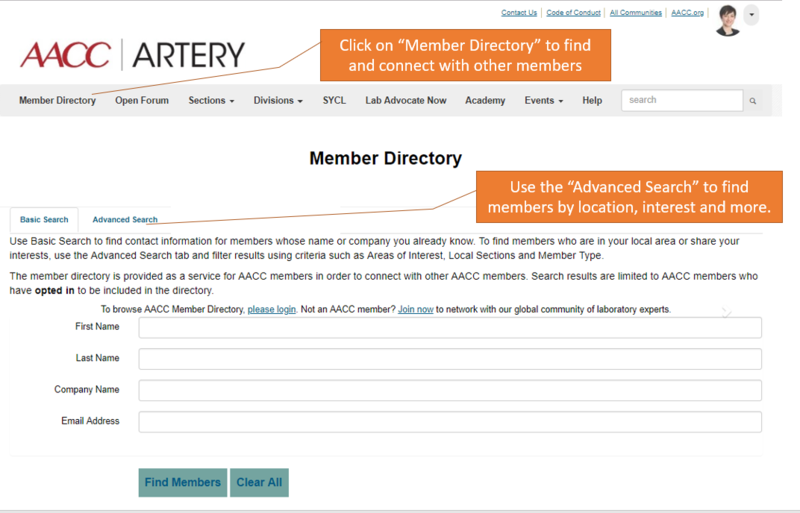 Navigate to the profile of the member you would like to connect with by searching the Member Directory. Click on Add as Contact. 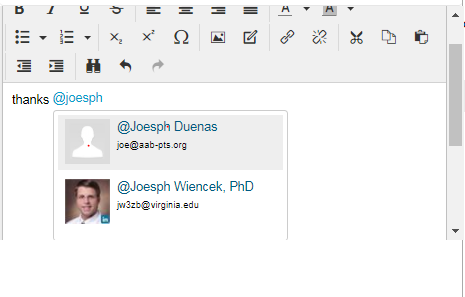 You can also hover over any name in a discussion and add that person as a contact. Check the Connections tab in your profile to keep track of your contacts and networks. Artery Ambassadors are the most active Artery users and have committed some of their free time to help other users get the most out of the online community. If you think this might interest you, please visit our Ambassador Page for more information. You can use private messaging to make a connection and share information directly with an individual. Using the Member Directory, locate the individual you wish to message. Your email will arrive in the individual’s inbox. Ask open-ended questions. Broad questions that seek feedback or opinions will get the best responses. Keep your subject lines brief.A concise subject line allows members to respond appropriately to your posting or search the archives by topic. You can link to additional information in the body of your post if needed. Describe your question in the body.In contrast to the subject line, use the body of the post to explain your question in detail, providing sufficient information for other members to understand how to respond. Personalize your question. Share context or background. Do you have an urgent question but no time to login to the Artery? You can create a new thread through your email. Find an email digest from the forum that you want to post to. Type up your subject line and your post as if it’s an email. Your thread will show up promptly in the community. In a hurry and can’t login to the Artery right now? 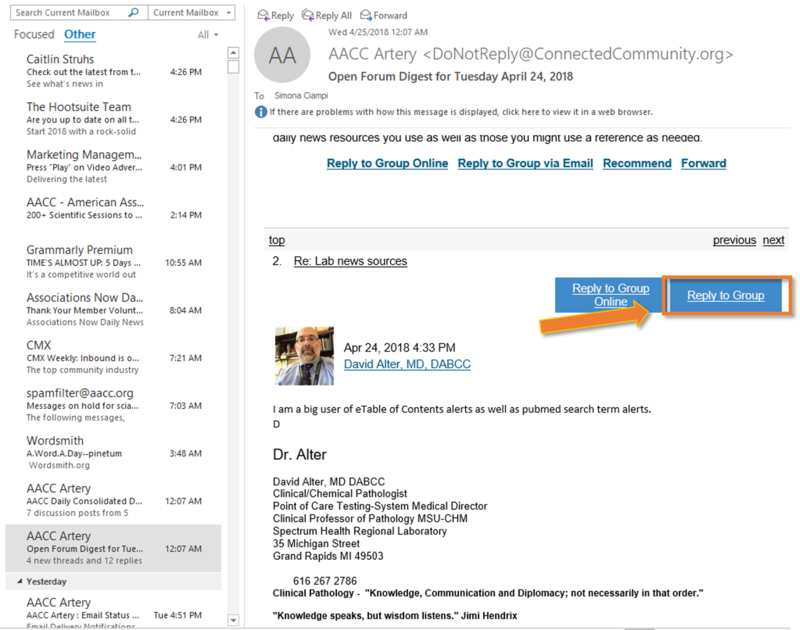 You can still respond to Artery discussions directly via Daily Digest. Open the Daily Digest email in your inbox. Scroll down to the thread you want to reply to. A new email box will open with the email address and subject line pre-populated. Type your response into the message area and click send. Your reply will show up promptly in the community. Want to make sure you don’t miss any of the great conversations on Artery? 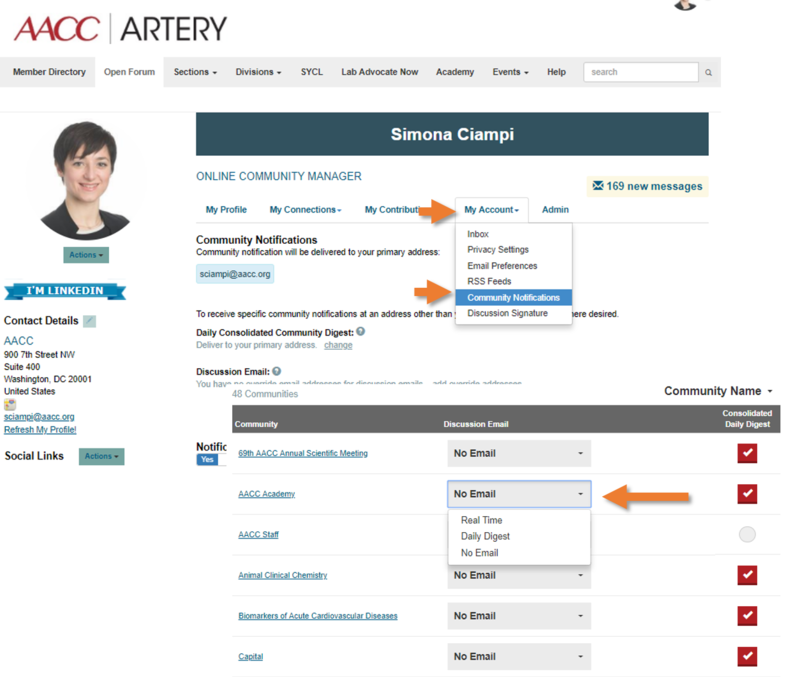 Add the community notification email address to your address book (safe sender list). First, check your settings in your Community Notifications. 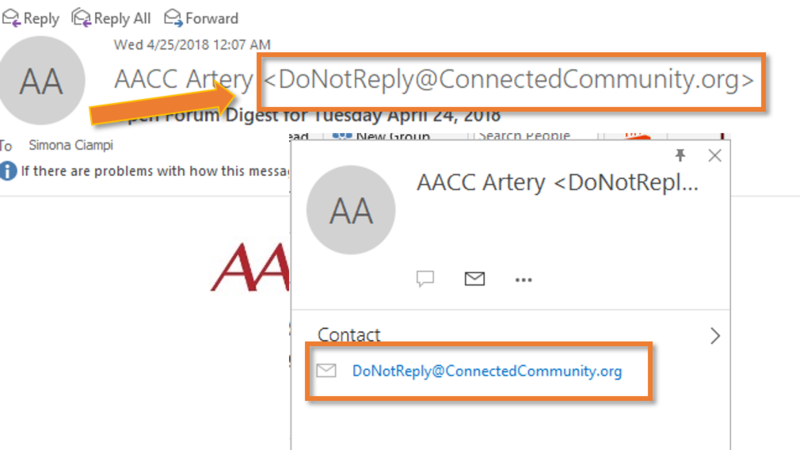 If your email provider is blocking Artery email, you’ll need to whitelist Artery. For example, if using an email provider like Gmail or Yahoo, you’ll want to add the appropriate email domain or the “from” email address 'donotreply@connectedcommunity.org' to your “safe” list or address book. If you’re using a business email, you’ll want to contact your employer’s IT department or vendor. Mentioning other users in a discussion likely will catch the attention of that member and make sure he or she sees your reply. In fact, mentioned members will receive a brief email notification that they were mentioned in a conversation. If you’re posting on a frequent topic in Artery, you can use the hashtag feature to tag your content with that topic. The hashtag will convert to a hyperlink that will take readers to search results for other posts with the same tag. 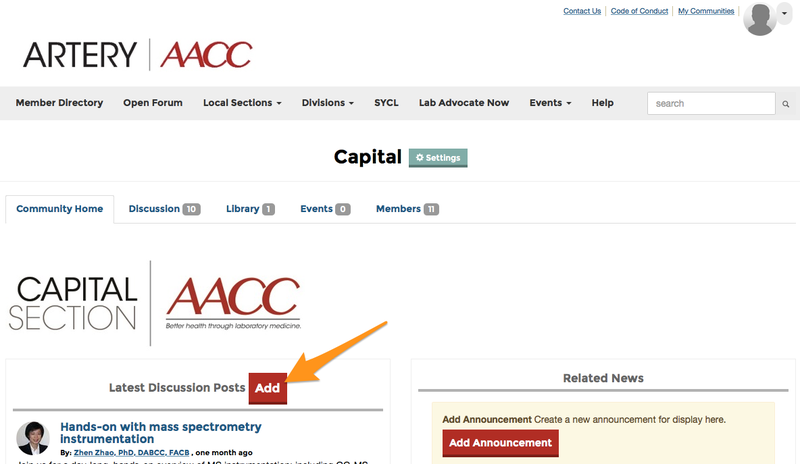 It’s a great way to link related content and help other members find past conversations on the same topic. Type the “#” symbol and scroll through the list of topics or start typing to narrow your search. Select the topic (if available) to hashtag your content. Help someone facing your same challenges by marking the best answer to your question. If you have asked a question and others have replied to it, you can indicate which of the responses is the best. Note, only the person who started the discussion can decide which answer to that discussion is the best. Everyone will now see a red flag “Best Answer” on top of that reply. Do you remember something you liked but don’t know how to find it? Giving a like is a good way to save things that interest you, and you later can find the topics you liked by visiting your profile. Remember What, not Where? Have you created or replied to a conversation but can’t find it? With Artery, you can easily get to all the content you have worked on by visiting your profile. Navigate to your profile and go to the My Contributions tab. 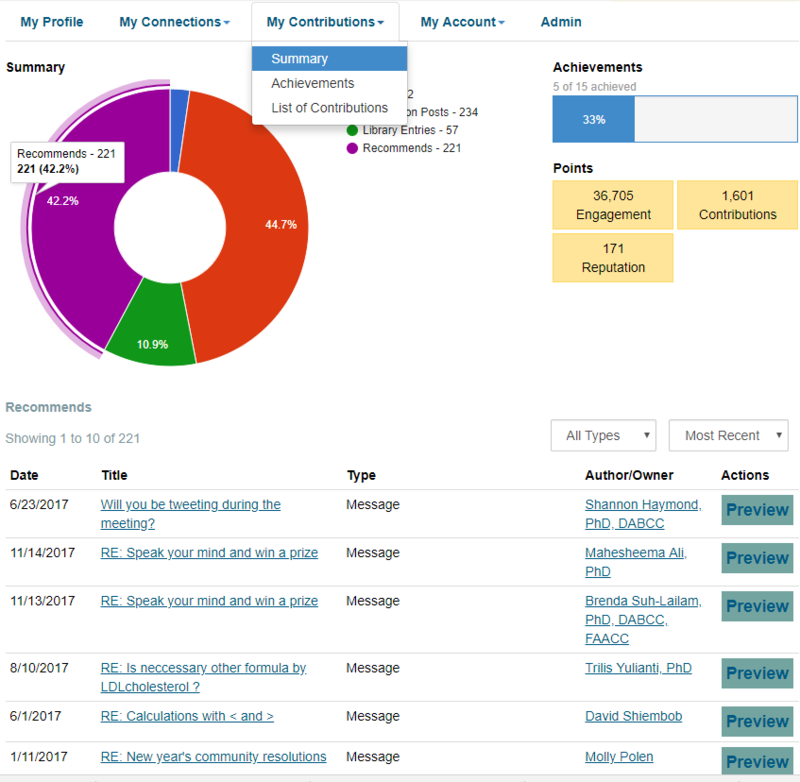 Inside that tab, select “List of Contributions”, and you will be able to see all your replies, conversations, and uploaded documents.